Could High Heels Really Be Dying Out? We can't imagine the exhilaration of buying a divine pair of heels ever fading, but over the past week, a large body of proof has been building out against more glamorous shoe factions. Just look at the crystal-embellished beauties above—could you really give them up? Maybe you have already. 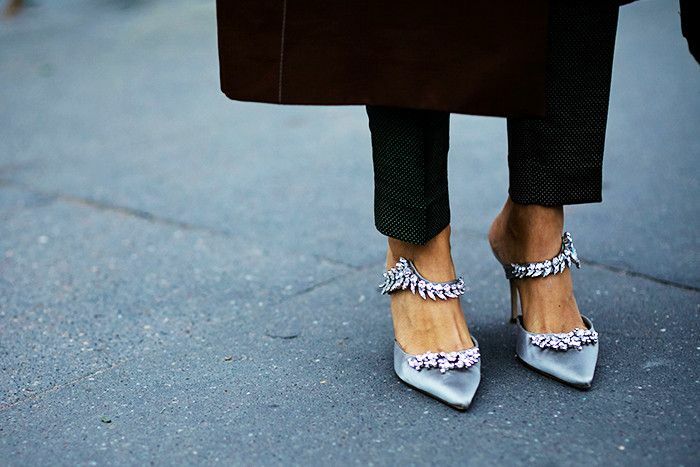 From interesting statistics to visible proof on the streets of fashion week, there's no denying that a flat-shoe boom is currently in progress. Keep reading to find out the reasons behind the movement—and to catch up on the rest of the week's major fashion news. 1. One particular sneaker ruled supreme across New York, London, Milan and Paris. Can you guess which £52 cult favourite made the grade? 2. This wasn't the only trainer with a major moment in the spotlight: Kate Middleton proved the power of this classic lace-up. A style that Alexa Chung also favours, you know. 3. And, as if that wasn't proof enough, along came some major stats. Mintel reported a significant change in women's shoe-shopping habits—all signs points towards flats, flats and more flats. 4. Talking about fascinating stats… We found out the five fashion items that are officially taking up the most space in the UK's shopping baskets. How many of these key items do YOU already own? 5. We're no good at rationing our fashion purchases, but we do think we could get on board with these clever diet tips from our sister site Byrdie. Did you know that going gluten-free is probably stopping you from losing weight? 6. If you're as obsessed with wedding dresses as the rest of the world, then you mustn't miss this incredible backless number. 7. Fashion month came to a close—but the ideas still rumble on. From the S/S 17 trends we're convinced you already have in your wardrobe to seeing one of our super bloggers, Sofie Valkiers, cosying up to Rihanna on the FROW, there's much to discover and enjoy. 8. And we finally asked the big question: Just how often should you wash your bra? Among other lingerie mistakes, we tapped Agent Provocateur's main lady for answers. From news to sensible shopping—it's definitely time to invest in your best-ever winter coat.